– Can be made playable on Region B devices by having the country code set to America. Plot: The lockers are splattered with blood, the student bodies are piling up and that’s not mystery meat they’re eating in the cafeteria… it’s the faculty! And that’s just the start of the worst day of school ever when a nightmarish virus is unleashed, turning humans into flesh eating zombies and converting Fujimi High School into a literal hell on Earth. Now it’s a crash course in survival, and the only test or skill that matters is the ability to keep moving, breathing and fighting. Because if nerds, jocks and the surviving staff can’t find a way to work together to escape this carnal house of education, they’re all going to end up on the menu. And that’s assuming there’s anyplace safe left to escape to. 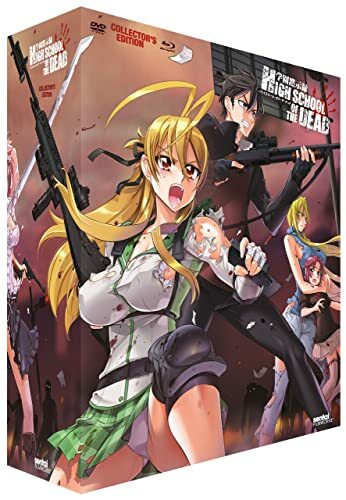 At the sound of the school bell, the Zombie Apocalypse will begin as Kumuro, Saya, Rei, Busujima, Hirano band together in the ultimate collectors’ edition of the wildest anime about reanimated corpses ever: HIGH SCHOOL OF THE DEAD! Scott is the Founder and Executive Editor of AnimeBlurayUK but in the past he has worked at ZOMGPlay, Rice Digital and Funstock and was once a Community Moderator for the Nokia N-Gage forums. Based in the UK, he loves anything related to Games & Anime and in In his spare time you'll mostly find him playing on one of his many gaming consoles; namely the PS Vita, PS4 or Xbox One.